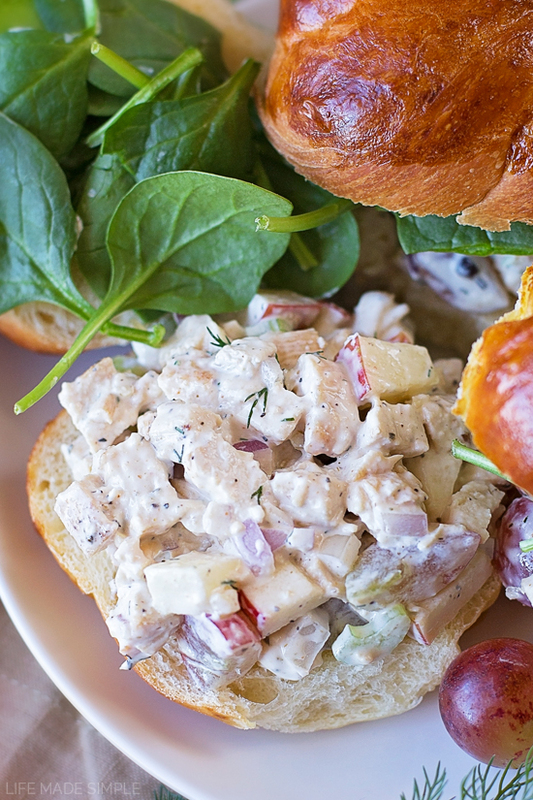 Chicken salad is one of my favorite things to order at a deli or bakery. 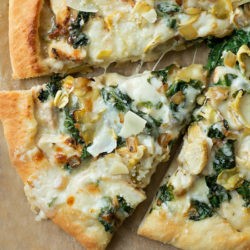 I love how flavorful it is and that usually it comes piled high on some kind of amazing bread. A few weeks ago when I helped make food for a baby shower I whipped up this recipe and immediately fell in love. It’s got so much going on, every bite is as good as the last. My secret? Lots of texture from fruits, veggies and nuts, fresh dill and a little bit of Greek yogurt. 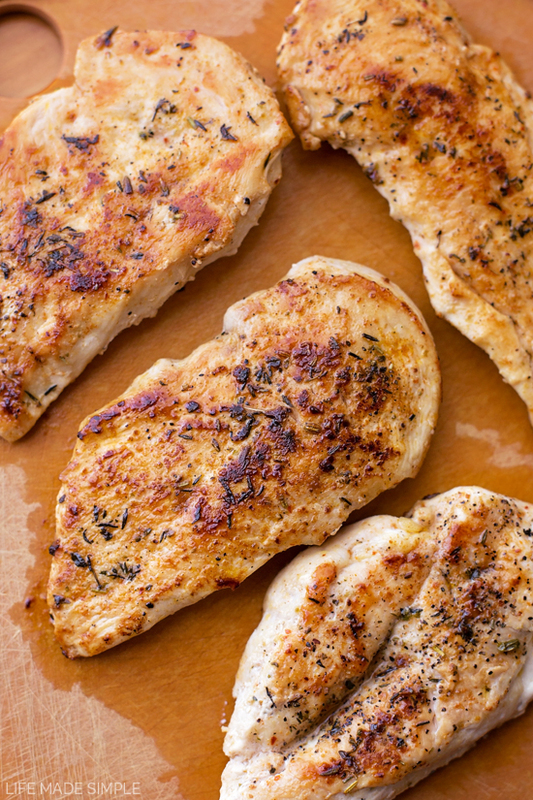 We normally have a lot of chicken on hand so I usually have the hubby season and grill some chicken breasts, but rotisserie is great for this recipe too! Either way, make sure it’s safely chilled before using it! Get it cubed and toss it in a large mixing bowl. Chop and dice some grapes, apples, celery and toasted nuts too. 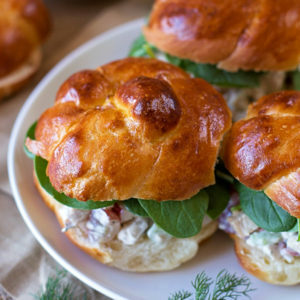 If you plan on eating the chicken salad within a few hours go ahead and toss the nuts in, but if you’re saving it for later, I’d suggest leaving them out so they don’t get soggy. Mince up some fresh dill (it’s one of my secret ingredients) and combine that with some onion powder, salt, pepper and a combo of Greek yogurt and light mayonnaise. I find that using a little plain Greek yogurt helps lighten things up and adds even more protein to this salad. I like to add a little extra to keep things moist (plus it’s Greek yogurt, so it’s healthy right? ), but you can add as much or as little as you like. Instead of full-fat mayo I prefer light or mayonnaise made with olive oil. Of course if you prefer homemade you can definitely use that too! Whisk together the creamy base and pour it into the mixing bowl with all of the prepped ingredients. Toss it, chill it and then serve it nice and cold. I like placing a big scoop of it on croissants or challah rolls, but you can also make wraps out of it too! 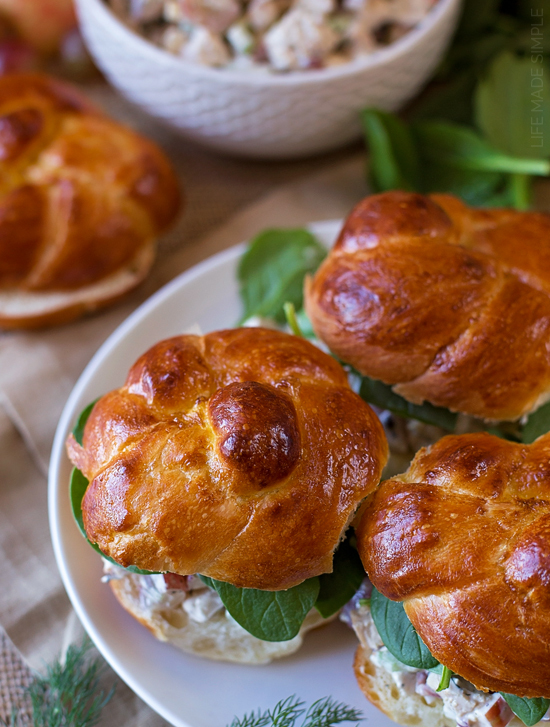 Toss on a little spinach or spring mix and you’ve got a plate full of beautiful and delicious sandwiches that everyone is guaranteed to love! Enjoy! 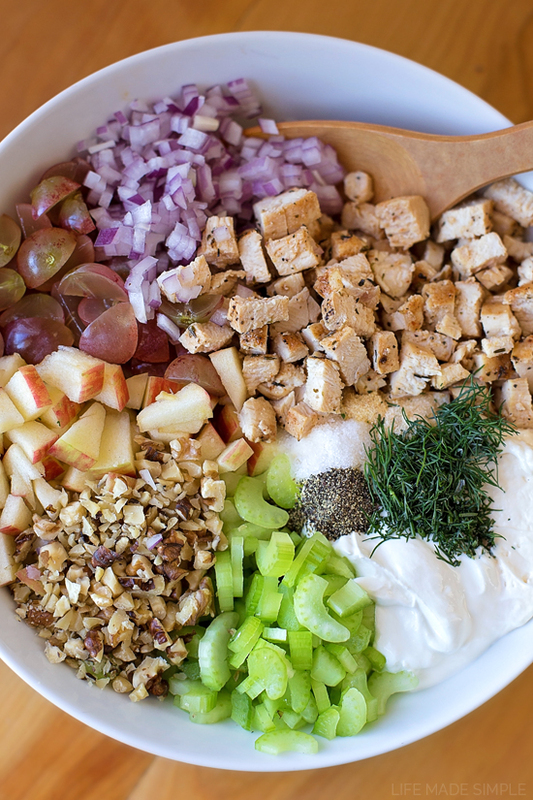 Freshly minced dill, toasted walnuts and Greek yogurt are the secret ingredients that make this chicken salad so good! 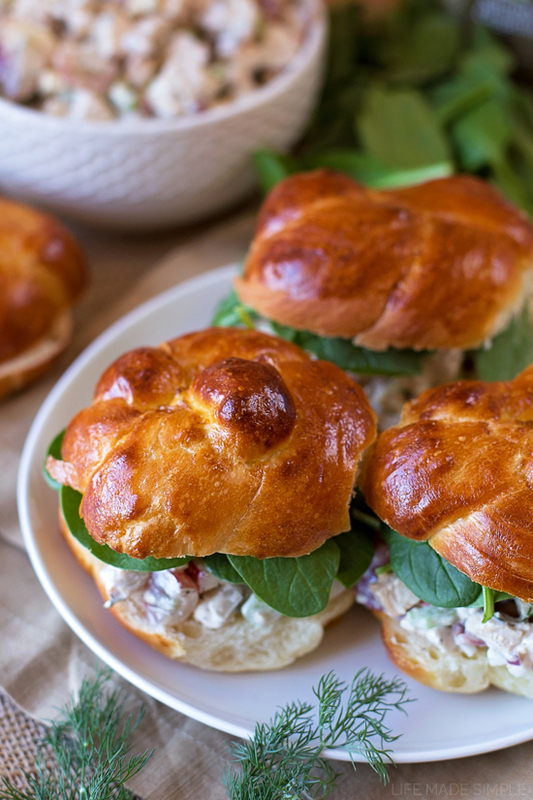 These autumn chicken salad sandwiches are perfect for special occasions or family dinners. In a large mixing bowl, combine the chicken, celery, red onion, apple and grapes. In a small bowl, whisk together the Greek yogurt (or sour cream), mayonnaise, dill, onion powder, salt and pepper. Pour the mixture into the bowl and toss to combine. Refrigerate for 1 hour, then fold in the nuts before serving. -If you are making this recipe in advance, leave the nuts out and toss right before serving. 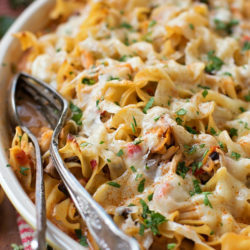 This looks soooo good!! Just bought chicken on sale, may need to try this soon! !